Alzheimer’s disease and Parkinson’s disease are not the same. They affect different regions of the brain and have distinct genetic and environmental risk factors. But at the biochemical level, these two neurodegenerative diseases start to look similar. That’s how Emory scientists led by Keqiang Ye, PhD, landed on a potential drug target for Parkinson’s. In both Alzheimer’s (AD) and Parkinson’s (PD), a sticky and sometimes toxic protein forms clumps in brain cells. In AD, the troublemaker inside cells is called tau, making up neurofibrillary tangles. In PD, the sticky protein is alpha-synuclein, forming Lewy bodies. Here is a thorough review of alpha-synuclein’s role in Parkinson’s disease. Ye and his colleagues had previously identified an enzyme (asparagine endopeptidase or AEP) that trims tau in a way that makes it both more sticky and more toxic. 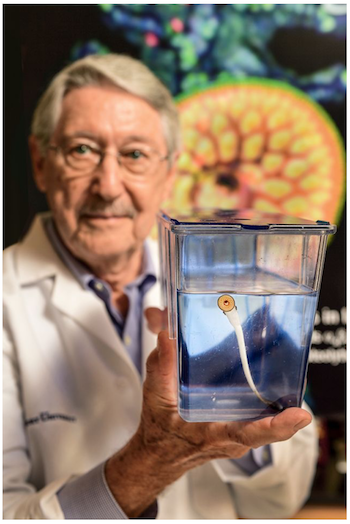 In addition, they have found that AEP similarly processes beta-amyloid, another bad actor in Alzheimer’s, and drugs that inhibit AEP have beneficial effects in Alzheimer’s animal models. In a new Nature Structural and Molecular Biology paper, Emory researchers show that AEP acts in the same way toward alpha-synuclein as it does toward tau. 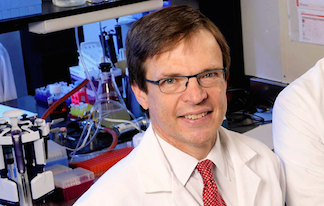 A particular chunk of alpha-synuclein produced by AEP’s scissors can be found in samples of brain tissue from patients with PD, but not in control samples, Ye’s team found. In control brain samples AEP was confined to lysosomes, parts of the cell with a garbage disposal function. But in PD samples, AEP was leaking out of the lysosomes to the rest of the cell. Keqiang Ye’s lab at Emory recently published a paper in Nature Communications that offers a two for one deal in Alzheimer’s drug discovery. Periodically we hear suggestions that the amyloid hypothesis, the basis of much research on Alzheimer’s disease, is in trouble. Beta-amyloid is a toxic protein fragment that accumulates in extracellular brain plaques in Alzheimer’s, and genetics for early-onset Alzheimer’s point to a driver role for amyloid too. Unfortunately, anti-amyloid agents (either antibodies that sop up beta-amyloid or drugs that steer the body toward making less of it) have not shown clear positive effects in clinical trials. That may be because the clinical trials started too late or the drugs weren’t dosed/delivered right, but there is a third possibility: modifying amyloid by itself is not enough. Pathologist Keqiang Ye and colleagues recently published a paper in PNAS that may have implications for Parkinson’s disease pathology and treatment strategies. The protein alpha-synuclein is a bad actor in PD (nice explainer from Michael J. Fox Foundation); it’s a major constituent of Lewy bodies, the protein clumps that appear in PD patients’ brains, and there is a genetic link too. Alpha-synuclein seems to bring other proteins into the clumps, which may disrupt neuron function. In particular, it sequesters PIKE-L, an inhibitor of AMP kinase, leading to AMP kinase hyperactivation and cell death. AMP kinase is a metabolic regulator activated by metformin, a common treatment for diabetes. So activating AMP kinase in some situations can be good for your body; however for the neurons affected by alpha-synuclein, activating it too much is bad. Call it the reverse spy problem. If you were a spy who wanted to gain access to a top secret weapons factory, your task would be to fit in. The details of your employee badge, for example, should look just right. As described in this 2016 JCI Insight paper, Emory and University of Toronto investigators wanted to do the opposite. 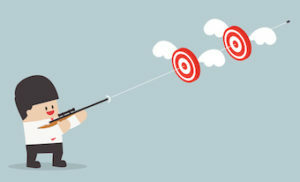 They were aiming to develop antibody tools for studying and manipulating plasma cells, which are the immune system’s weapons factories, where antibody production takes place. The situation is flipped when we’re talking about antibodies. Here, the goal is to stand out. Do these guys look like good spies? Monoclonal antibodies are classic biomedical tools (and important anticancer drugs). But it’s tricky to develop antibodies against the places where antibodies themselves are made, because of the way the immune system develops. To guard against autoimmune disease, antibodies that would react against substances in the body are often edited out. To get around this obstacle, researchers used organisms that have very different immune systems from humans: lampreys. 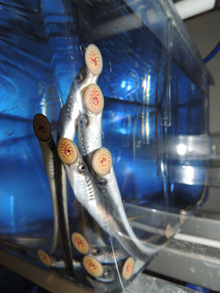 Emory’s Max Cooper and colleagues had already shown how lampreys have molecules — variable lymphocyte receptors or VLRs — that function like antibodies, but don’t look like them, in terms of their molecular structure. We reasoned that the unique protein architecture of VLR Abs and the great evolutionary distance between lampreys and humans would allow the production of novel VLRB Abs against biomedically relevant antigens against which conventional Abs are not readily produced because of structural or tolerogenic constraints. 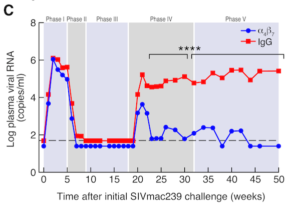 The surprising finding that an antibody treatment can push SIV-infected monkeys into prolonged remission, even after antiviral drugs are stopped, continues to rumble across the internet. Blue circles show how viral levels stayed low even after antiretroviral drugs were stopped. The Science paper was featured on NIH director Francis Collins’ blog this week. NIAID director Anthony Fauci has been giving presentations on the research, which emerged from a collaboration from his lab and Tab Ansari’s at Emory. Fauci’s talk at the recent HIV prevention meeting in Chicago is viewable here. HIV pioneer Robert Gallo noted in an article accompanying the Science paper that the anti-integrin antibody treatment represents an emerging alternative to the vaunted “shock and kill” strategy, which he termed “soothe and snooze.” Note to reporters: the upcoming “Strategies for an HIV cure” conference at NIH in mid-November might be a good chance to compare the different strategies and put them in perspective.